You guys are so silly with your stereotyping. Believe it or not, I hardly ever play metal. Pippynip wrote: I play soft and relaxed all the time, I only play harder when I need to. Then again, you probably need to for metal... Yeah, just practice a lot and it should be fine. Edit: One thing you could do is turn the gain up a bit. Fiddle with the EQ and the gain and you could probably give it a metal sound even when you play soft. Like I said, turn up your volume, fix your tone and EQ and you will be fine! Oh and you don't need a 100W amp to make it sound metal! No you need 300W for that! . I'm in a band with two guitarists and they both use 100 wat amps, I have a 300 wat amp but with an extension cab I can get 400w, I need that headroom without having to crank my gain to much so it sounds horrible. With that amp I can cut through nicely without having to pound my strings and after I've told our rhythm guitarist to cut the bass out of his amp as thats my freq space. I probably actually did say that at one point. And I do like playing hard, it gives it a unique tone, but I usually don't play extremely hard at all. At home I tend to play soft, but when I'm playing with the band I tend to play heavier. Its kind of hard not to, I get excited and I like the sound of playing hard through a loud amp against the sound of our very loud drummer. It can sound kind of crap on its own but it works so well when played with drums. I've been feeling pretty apathetic lately and don't have any emotion for my music. Ideas? Don't try and make any more music for a bit. Do something else. Up to you what you do, just don't try making any more music. Replenish your creative juices. How do you practice scales? Okay here's a question that's really been bothering me. I know everyone says to practice your scales and learn em all and stuff, but how do you actually practice them? I mean the shape is easy, getting them memorized takes a few minutes. But what is it that you're supposed to be practicing with scales? Improvising over the shape? I just don't get it. MetalJacob wrote: Improvising over the shape? I just don't get it. Thats pretty much it dude. Just noodle around the scale until you come up with a phrase you like. That's seriously it? Surely there has to be or people wouldn't make it so important. There are two scales in general and they are very important because everything revolves around them. Generally you need to practice moving around in as many different patterns as you can. The second stage is much more complex as it covers what people call "modes" I think. Stryfer wrote: There are two scales in general and they are very important because everything revolves around them. Generally you need to practice moving around in as many different patterns as you can. It's not really that complex once you get the practice down. I can play all the modes of the major and minor scale, it took me awhile to get them down right but once you master it it becomes easy. Everything I do is based on modes, if I know the key of the song and the chords being played I'll come up with a line based on the modes. @ Jacob, well what do you think lead guitarists do when it comes time to solo? Learning scales and all the modes means that if I'm in the key of Eminor for example, I can hit an open E then run up the fretboard to a high E on the G string fast with little effort. You like death metal don't you? Look at what Alex Webster does, he is all over the fretboard, its all scales man, running through scales and finding that pattern that best fits. Yeah everyone tells me to look at Alex Webster. I never bothered with modes, is that what makes it applicable to go up and down the fretboard? What I'm saying is, when you learn a scale shape, it's usually one locked in box area using the same frets, and not many octaves of the notes. Does learning modes allow you to become better at using many octaves and being able to use the entire fretboard? 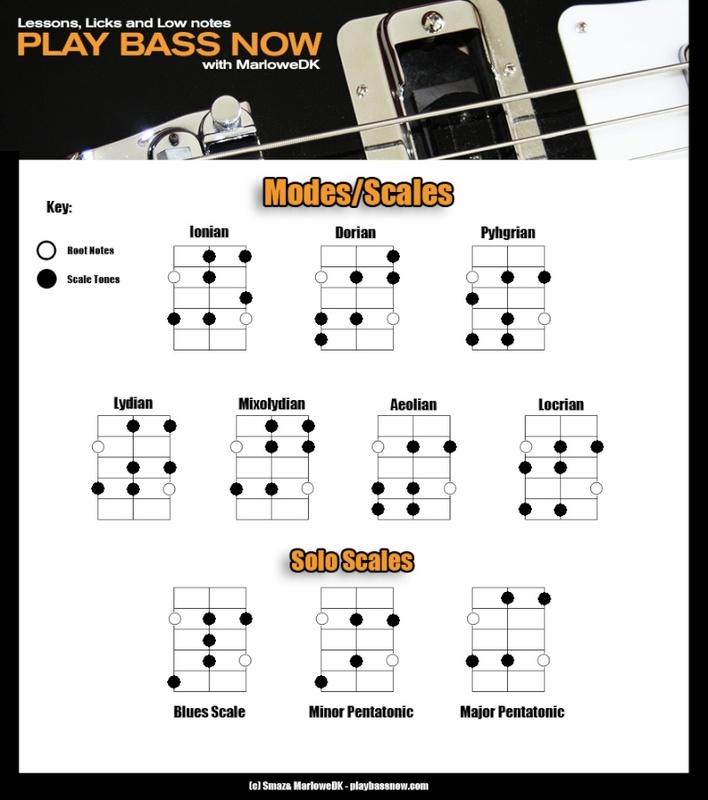 Modes are a way of spreading the scale over the entire fretboard. Sooo learning modes is the way to go? I would recommend it, even though I've tried it and realized that it's not for me. Alright thanks guys! I'll get to working on it. Are these patterns the same things as modes? These are what I need to learn, right? Not those, no. Plus those are for chordy midget weakling guitars, not our lovely massive bom-de-bom buggers. It's these patterns that lololiet posted on page 2 that are the modes. Oh I see. But the things I posted are also worth practicing, eh? Probably. Pattern 1 is just a different way of playing the middle solo scale, I imagine it's a similar story for the other patterns. Okay great. I'm going out of town for a few days soon and bringing my bass so I'll write all of this down and hopefully get a lot of practice in. Also, just noticed phrygian is spelled wrong on that chart.